Nasty woman, Vera Chok sat down with me to chat about the Paper Man and the power of performance. Whose stories do we get to tell and who gets to the tell them? If you are looking for food for thought, you have come to the right place. Four women struggling for *power* in a *small* room with a nice white man! The Paper Man: (left to right) Vera Chok, Adrienne Quartly, Lee Simpson, Jess Mabel Jones, Keziah Joseph. Photo credit: Camilla Greenwell. When it comes to talking about The Paper Man I don’t quite know where to begin. It’s not just a play, it’s been an extremely joyful, nourishing and traumatic part of my life over the past two years and I don’t use the word trauma lightly. 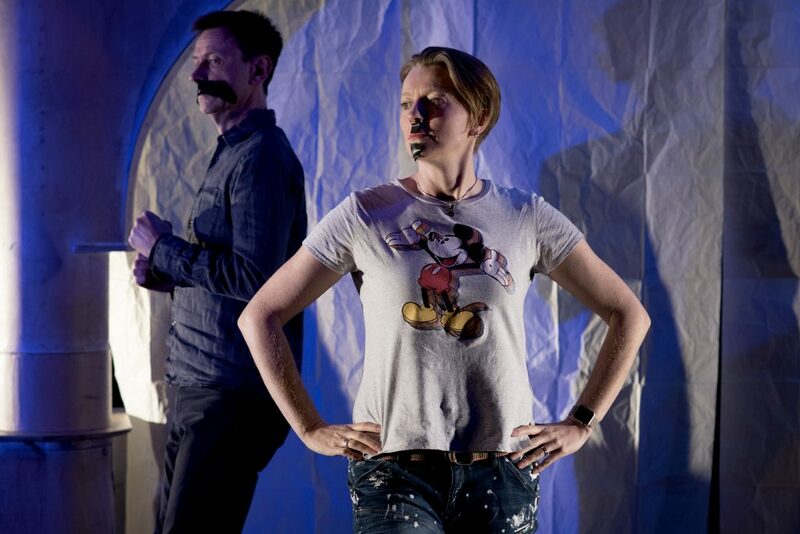 Devised and part-improvised, this show has forced the group to continually re-evaluate and explore power structures in the world but also in our industry. They did exactly what I asked them to do and … I don’t like it. But I think it started out as a much simpler thing. 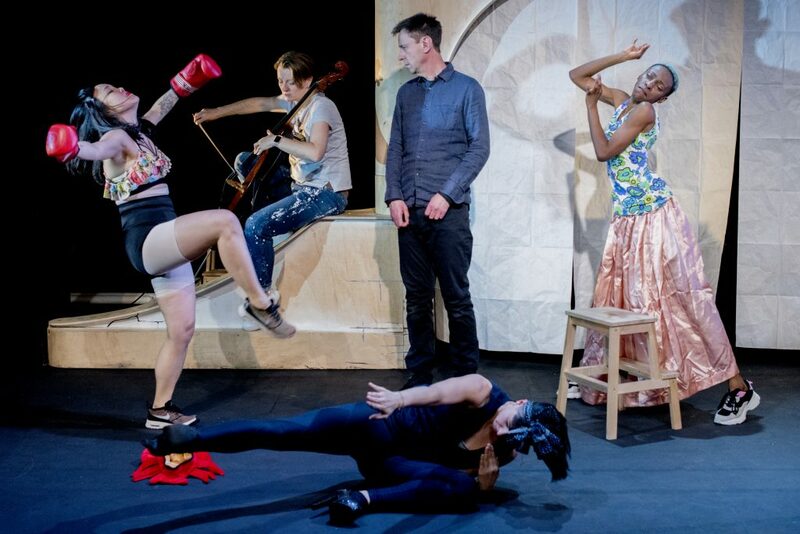 Lee Simpson, co-artistic director of Improbable, a company known for being liberal and inclusive, invited new blood into his company. He says he wanted to tell the story of Matthias Sindelar, an Austrian footballer who (maybe) defied the Nazis. Did Lee imagine himself as some sort of Sindelar figure, taking a stand against the rise of fascism today, publicly showing himself as an ally to the oppressed the way Sindelar did for his Jewish acquaintances? Improbable’s other more prominent artistic director, Phelim McDermott, has won Oliviers for his work. But he also stages operas with the English National Opera which have white singers playing Indians and Egyptians. When asked about his involvement, the party line has been that it is “not that simple”. Improbable is a twenty-one-year-old company set up by a coalition of white men, and initially in 2018, due to some self-confessed misunderstandings along the way, a team of three white men were employed as the directors of The Paper Man, with three female-presenting, younger cast members making it. One was a Black British woman, the other was a white ‘commoner’, a Croydon type, and an ex-colony Malaysian-Chinese, me. Paper Man: (left to right) Keziah Joseph, Adrienne Quartly, Lee Simpson, Jess Mabel Jones, Vera Chok. Photo credit: Camilla Greenwell. As a team, we discussed that we want to create theatre that reflects the world. Well, what we’ve made is that. The oppression of the weak, the institutional bias against women, the hierarchy between people of colour, and the intersectionality of identities and the frustrating impossibility of including everyone is played out in our 90 min show. To alleviate the weight of what we explore, we have an abundance of snacks (how often do we see women actually eating on stage), sequins, and silly dancing. Everything is tested with irreverence. Is it too much about women? Maybe for some people who don’t like women. Is The Paper Man about football? No, not really. I mean, there’s a lot to be said about the relationship between football and fascism, the power of crowd mentality, and the manufacture of nationalist identity. But football does bring people together. It’s been said that the best football teams are socialist, that the language of football – unity, solidarity, goals, coming together – disposes of hierarchy. Incidentally, watching football is like watching an improvisation – the players keep the ball moving, we never know what’s going to happen next but it’s beautiful. It’s been a project and a half. I’ve fallen in love over and over and I’ve had my heart broken. I couldn’t yet tell you what it all means but good lord, we’ve put everything into it. It’s about power and the painful redistribution of it; it’s about resistance; it’s about coming together even when that feels like the last thing we wanna do; it’s about being painfully, dangerously honest; it’s about taking the piss; it’s about irreverence; it’s about not knowing what to do next; about being overwhelmed and lost and deeply, existentially sad; it’s a little bit about Croydon; it’s about hope; it’s about beautiful things, about sequins (! ); it’s about dreaming something different to the systems we can’t see a way out of. I want as many people as possible to see The Paper Man. If we believe in art changing the world one person at a time, I’m hands up the greedy one. I want the show, our stories and our ongoing struggle to remain disparate yet supportive co-creators in a dangerous space, to invade your hearts and minds. I’d love for our deep despair and our sparkling joy, our mistakes and our discoveries to activate audiences to live and laugh with ferocity, whatever that means to them. 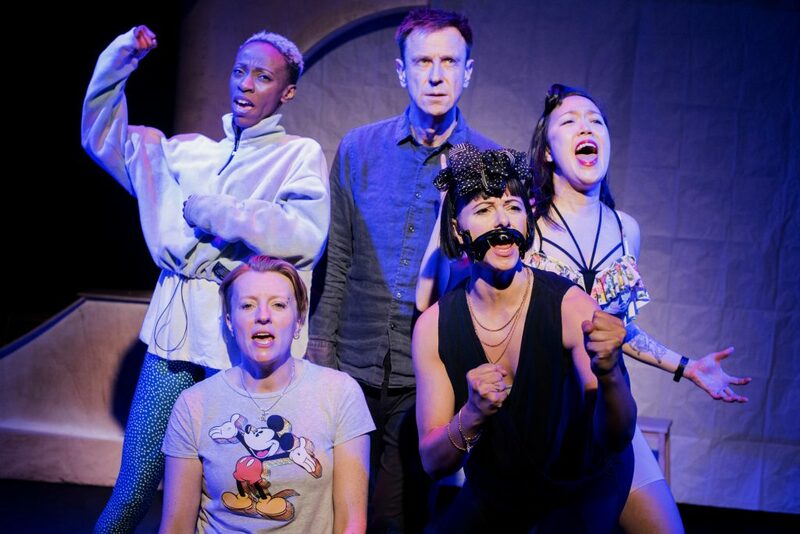 Paper Man: (left to right) Vera Chok, Lee Simpson, Jess Mabel Jones, Keziah Joseph. Photo credit: Camilla Greenwell. For a while now in my job I have felt pretty much ignored by the ‘creatives’ in the room. This is. with the exception of some companies who exist to make collaborative work. I had thought, “Well maybe it’s just an ego thing, you know, all those actors showing off onstage. I’m not about that, so why would anyone need to notice me?” And then The Paper Man came along. I was already at a crux. It was time to go back to a more musical approach to my work. Bring out that cello I’d spent 20 years of my life practising. Sound design covers such a large array of skills that it’s hard for anyone to really understand what we do. ‘We’. I question how many people really see us as ‘artists’, as opposed to technicians. The way some people talk about my sound design in the room is with a critique one would never use for an actor’s skillset. Can’t they understand that this is my voice, a voice which is constantly told not to interrupt the text and to be quieter? Well Improbable didn’t do that. Open Space Technology (OST), as I see it, is an opportunity for all voices to be heard. You don’t even need to present with spoken word, you can write it down and then it’s on the wall. In the room. There. Noticed. The first time I worked with Improbable I spent much of my time putting questions on the wall like ‘What about the sound?’. Making sure it wasn’t forgotten. It wasn’t. So, in this process, surrounded by a supportive team, my dreams, hopes and fears were slowly drawn out of me. Their fascination began to increase towards me, this person who arrived in the room, who didn’t say much, and initially playing music alongside their dancing. Who was I? My confidence grew in being able to express myself. Surrounded by enthusiasm and encouragement I felt finally like I could give myself permission to fully join in. To be me in a space. Not the invisible member of the creative team. I can’t really express how powerful this was. It was all there all of the time, however it took this system and this specific group of people to help facilitate the opening of this Pandora’s box. I finally felt understood. Taken seriously. Allowed equal creative space to express things. This project has also been painful, difficult, but for me, completely liberating. Whether you like it or not, this is me, here now. The Paper Man: Adrienne Quartly. Photo credit: Camilla Greenwell. 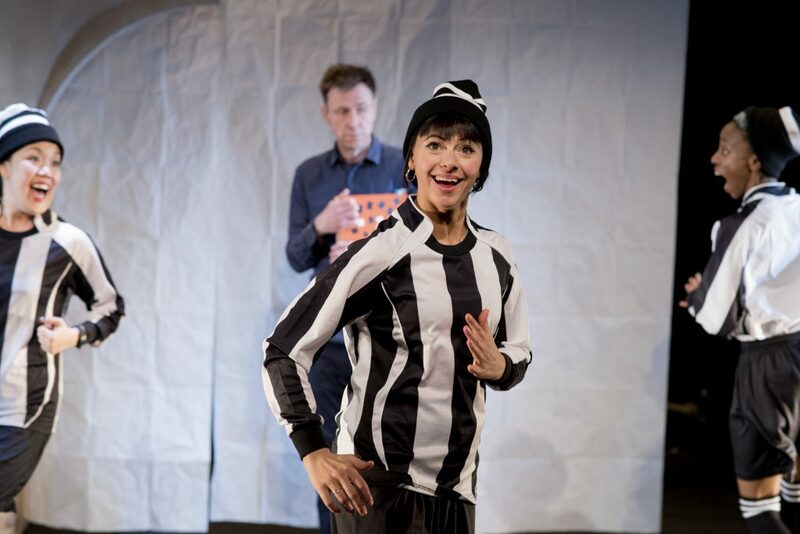 The Paper Man is on at Soho Theatre until March 9th, 7.15pm, Monday – Saturday; 3pm Saturday. Buy your tickets here.